Casualty number one for Prado DPF. Prado was doing a DPF burn today and I take off from the lights only to see a large plume of white smoke in my rear mirror. Cars only done 22000km and notice DPF temp wont go past 600deg while driving. In for inspection Monday morning .Will keep everyone updated. On this forum? Bugger. Hopefully will be resolved quickly. This may or may not be useful information? Hirano, T., Goto, I., Kitano, K., Kojima, T. et al., "Analysis of Sulfur-Related White Smoke Emissions from DPF System," SAE Technical Paper 2015-01-2023, 2015, doi:10.4271/2015-01-2023. In a Diesel engine with a Diesel particulate filter (DPF) system, high-sulfur fuel causes white smoke containing odorous and harmful pollutants during DPF regeneration. This study investigates the conditions and mechanisms of sulfur-related white smoke generation.Engine and vehicle tests found that sulfur compounds emitted from the engine accumulated on the catalysts in the DPF system and were emitted as white smoke during DPF regeneration. The white smoke was observed when the catalyst temperature was more than 450°C, under conditions such as the early stage of DPF regeneration.Model gas tests were conducted to clarify the mechanism of the white smoke. It was found that SO2 emitted from the engine was oxidized to SO3 on the catalyst, which was then mainly absorbed on the oxidation catalyst support (Al2O3). Then, the absorbed SO3 was desorbed and converted into white smoke. The intensity of the white smoke depended on the amount of desorbed SO3 and the rate of temperature increase of the catalyst. If that really is a cloud of poopy SO3, then you'd be advised not to be anywhere near it, it will quickly react with water vapor in the air in your lungs and burn your lungs. At those high regen temps it can also form sulfuric acid SO3 + H2O -> H2SO4, acid rain! that article mentions high sulfur fuel , but dont we get sold the Low Sulfur diesel in Oz? would the toxins be just as bad with low sulphur? The Toyota dealer confirmed the DPF unit needs replacement. ETA 1 month ex Japan. They are saying its due to a ECU firmware that was not optimised for the DPF's and if it were done when first purchased would have resulted in no issue. This makes me wonder if Toyota should do a recall to upgrade peoples ECU's to stop this issue from occuring. they probably wont do a recall unless its safety related. And as past experience shows they wont actually do anything about it unless the customer complains more than once . Even if you do complain they try to deny all knowledge or they say that no one else is having issues it must be just you. I must have a good dealer. 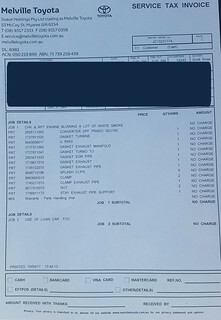 They indicated mine was the second vehicle in the last 2 weeks to have the issue and the other dealership had dealt with at least a half a dozen recently. Seams strange i think theres more to it than they tell us. Ive got 31000 now and have had no issues with the dpf and ours is used mainly for school runs then school hoilidays its towing a 2t van. Have you noticed any difference in the way it drives? They said they did an ECU update on mine before I get the new DPF and noticed a significant improvement on performance. Seems more responsive and possibly greater torque and power. I've only driven it home. This weekend I'm heading to Jurien Bay so we'll have a better feel of any changes. I just noticed a plume of white smoke when taking off at the lights this morning on the way to work. Lasted for about 5 seconds as i was accelerating up the hill. drove for another 15 mins but couldnt get it to happen again. planted the accelerator a few times and no smoke. should i monitor or contat toyota right away. did you notice the smoke several tikes in yours? i have a 2016 2.8 vx with 25000ks on the clock.